Eleven-year-old Quartz De Vindecy, under the charge of French professional driver Ludovic Peltier, took centre-stage during yesterday’s meeting after winning the Premier Class race. The programme also heralded the start of a new competition, the Assikura Championship for Bronze Class trotters. Eleven horses lined up for the Premier Class event. Quartz De Vindecy set the pace in the early stages, opening a slight lead from Palazio Valterne (David Ellul) and Pronostic De Neige (Michael Axisa). Quartz De Vindecy was unchallenged for most of the distance. Driven by Peltier, this French trotter cruised to its first win in Malta by a length-and-a-half from Quillian Joyeux (Andrew Farrugia). Vejby Boom (Charles Camilleri) and Gently Di Poggio (Michael Ellul) claimed the other top-four positions. Seven heats were organised for Bronze Class trotters with 28 horses qualifying for the semi-finals. In the first heat, French trotter Roff Gy (Noel Baldacchino) obtained its first win of the year after storming ahead with a lap to go. As expected, favourite Uranium Des Arkads led all the way in the second heat. Driven by Kurt Saliba, this trotter passed the post first easily by five lengths from Noble De Fontaine (Sandro Cutajar). 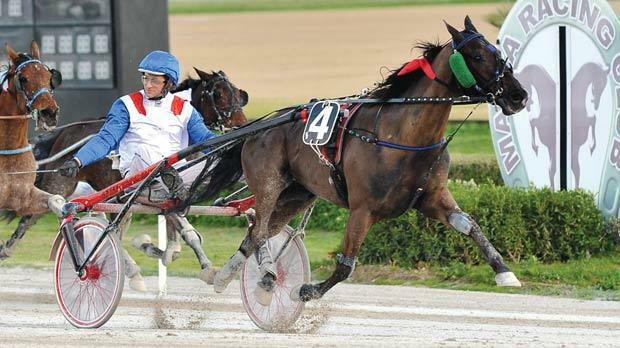 In the third heat, Ami Blou (Matthew Sammut) ran out of steam around 200 metres from the finish line and was overtaken by three trotters, among which was the race winner, Roc Des Rayons. The latter was under the guidance of its owner Gilbert Farrugia. Notre Joyeux (Charles Camilleri) upped its pace during the last 500m of the fourth Bronze heat. This French horse grabbed its first win of the year by half-length from Nimbus Bjerregard (Mario Farrugia). The fifth heat from the same competition was won by another French trotter, Paco, driven by Christian Xerri. This horse dashed strongly from the outside around 400 metres from the end. A keen tussle between four horses developed in the final straight of the sixth heat. It was Record Du Stade (Charles Camilleri) which registered its first win of the season. In the last Bronze heat, Reflexe De Crennes (Joseph Magro) had to go all out in the final metres to chalk up its second win in Malta from Winner Farming (Joseph Bartolo). The next meeting at the Marsa Racetrack will be held on Sunday. The first race starts at 1.30pm. Race 1: Silver, Andorra (Brian Zammit) – 1.19.2”. Race 2: Silver, Cal Win (Paul Galea) – 1.19.4”. Race 3: Gold, Netter Williams (Redent Magro) – 1.18.2”. Race 4: Assikura Champ., Bronze, Roff Gy (Noel Baldacchino) – 1.18.9”. Race 6: Assikura Champ., Roc Des Rayons (Gilbert Farrugia) – 1.19.8”. Race 7: Assikura Champ., Notre Joyeux (Charles Camilleri) – 1.18.9”. Race 8: Assikura Champ., Paco (Christian Xerri) – 1.18.6”. Race 9: Premier, Quartz De Vindecy (Ludovic Peltier – France) – 1.17.2”. Race 10: Assikura Champ., Record Du Stade (Charles Camilleri) – 1.19.6”. Race 11: Assikura Champ., Reflexe De Crennes (Joseph Magro) – 1.18.6”.